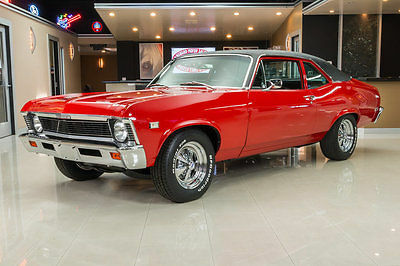 1969 Chevrolet Nova 1969 Chevy Nova for sale! 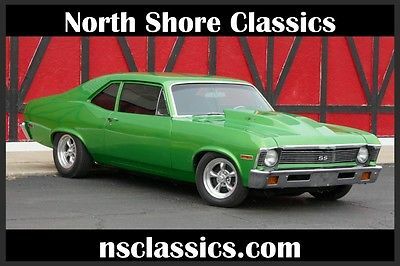 1971 CHEVROLET NOVA SS · Complete Rotisserie Restoration · Original Numbers Matching 270-hp Turbo-Fire 350 4-bolt main freshly rebuilt · Original Numbers Matching Muncie M-22 4 Speed · Original 12 Bolt posi rear end · Correct Tuxedo Black paint with correct Black Strato-Bucket seats · All SS Factory options. · Original Protect-o-plate and new vehicle warranty · Original window sticker confirming SS options and build. · Original Dealer invoice · Original inspection report · Original customer order form · Original owner manual and insurance documents. This Real SS is gorgeous and restored to Original Condition with excellent documentation. We look at all trades and invite independent inspections. WE ACCEPT TRADES For more information and photos please visit http://www.vaitx.com or call Vintage Autohaus & Imports at 806-359-9600. This vehicle is being advertised locally, we reserve the right to remove the listing at any time. We will accept trades. ZERO FEEDBACK OR NEWLY SIGNED UP BIDDERS MUST CONTACT US FIRST. DISCLAIMER This vehicle is being sold as is, where is with no warranty, expressed written or implied. No allowance or set aside will be made on account of any incorrectness, imperfection, defect or damage. Any descriptions or representations are for identification purposes only and are not to be construed as a warranty of any type. It is the responsibility of the buyer to have thoroughly inspected the vehicle, and to have satisfied himself or herself as to the condition and value and to purchase based upon that judgement solely. The seller shall and will make every reasonable effort to disclose any known defects associated with this vehicle at the buyer's request prior to the close of sale. 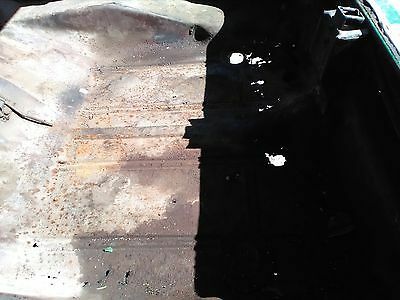 Seller assumes no responsibility for any repairs regardless of any oral statements about the vehicle. 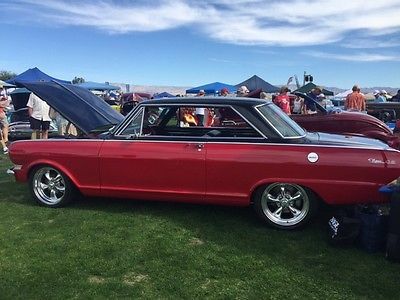 1968 CHEVY NOVA SS 396 SLEEPER EMBALMERS CAR CLUB BUILD 2017 We the Embalmers Car Club build one classic car per year. 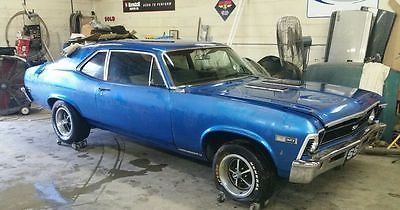 This year we BUILDT a frame off restoration of a 1968 Chevy Nova. NOVA INFO: The motor is a 1970 Chevy Big Block 396 30 over casting number 3969854 HI PER PASS. 4 Bolt Main. The transmission is a 4 speed Casting # 13-04-065-904 BORG WARNER rebuilt and new gear oil. The rear is a big 10 Bolt with a POSSI Rear with 373 Gears. The Nova has all newBody mounts. New Shocks and Springs. New E Brake lines. New brake lines. All of the bolts of the Nova have been cleared. The Carb is a 650 DP HOLY. The Int is all brand new. New 15 Inch Rims and new 15 Inch red line tires. The floors are sanded and restored to GM Stain Black. The motor compartment is all restored to a GM STAIN BLACK. The motor was buildt. Many new parts on used on the motor and thru out the car during the build. We Have many photos of the restoration. The Nova has P/S P/B FRONT DISC REAR DRUMS. The brake pads are all new. A REAL DEAL FRAME OFF RESTORATION. 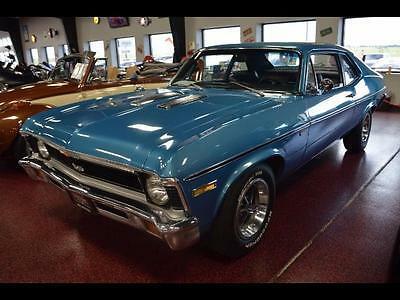 PLEASE NOTE YOU WONT FIND A NICER 1968 NOVA ON THE MARKET TODAY. 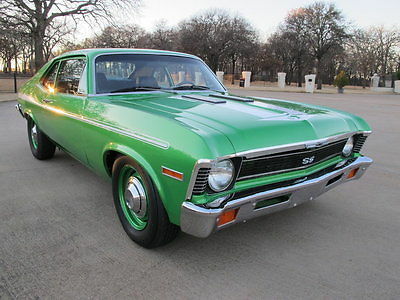 THE 1968 NOVA WAS A ONE YEAR DESIGN AND IT WAS THE FIRST YEAR FOR THIS BODY TYPE. GIVE ME A RING TO CHAT ! !JEFF 845 803-1776 MAKE A OFFER ! JUST SHOW SOME RESPECT FOR THE 400 HOURS WE PUT IN THE NOVA LOL. 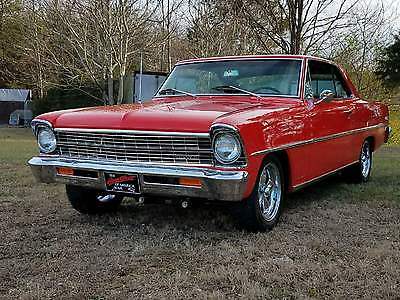 1962 Chevy II Nova. Gasser drag car built old school with patina. New gasser leaf spring front frame with disc brakes. ($4000.00). 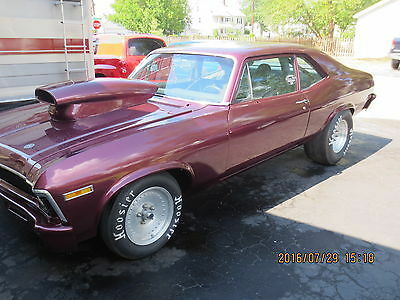 Built 406 ci engine, tunnel ram with dual Holley carbs, fender well headers, magneto ignition and mechanical tach.. Powerglide with shift kit and ratchet shifter. Roll cage, Gauges, new belts. Now has 4:11 posi rear end with traction bars, custom rear wheels. Ready to race including vintage gasser only events. Race car with clean title..Can be converted to street use. Optional choice of front wheels and tires shown in some pictures. $500 non-refundable deposit through Paypal. Selling to buy a 55 chevy convertible. Ita a super car at a sell it quick price!! Excellent condition 65, 350/350 with TH350. Has awsome Cam! Headers,flow masters over the rear axles. Strange narrowed 9" rear with 31 spline axles. 4 Wheel disc brakes. Mini tub. TCI front clip with power steering rack and pinion. Excellent handling! MARCH serpentine setup, vintage air conditioning. B&M shifter. Pioneer stereo with kicker speakers. Champion AL radiator w electric fans. Tilt wheel, classic industries guages. Car has 139 miles since running gear was installed. Newer interior. Paint is nice. The car is Hugger Orange/Black bumpers/door handles and mirror are mint. Newer weatherstripping. Floors and trunk are mint/solidHas nice cowl hood that sets off the front of the car.Twin Optima's in the trunk. Car has been rewired. New gas tank. 18" Boss rims with excellent rubber. This car can travel and all parts are available over the counter. TCI front clip is all Mustang parts and eibach springs. Rear suspention is all new also. I'm sure I'm forgetting some things, but you get the idea. Great car, priced to sell! Please call or text w any questions you may have. Joe 904 485 2272 I have bought vehicles via ebay so I know how to list and what's expected from a car bought online. 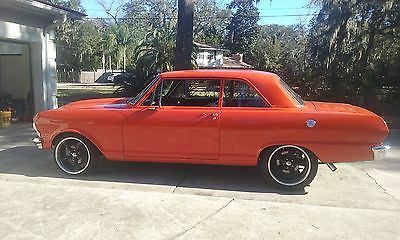 I'm selling this car to buy a 55 Belair from a friend, just the car I want. 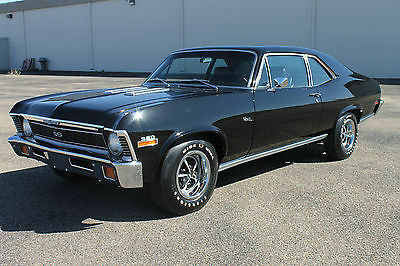 It's in no way as nice as this nova!! 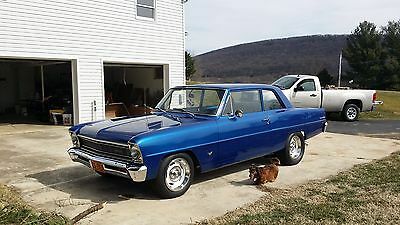 1968 Chevrolet Nova Nut & Bolt Restored! 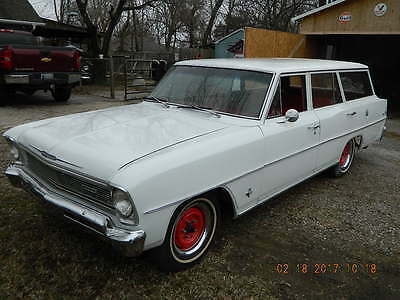 GM Crate 350ci V8, 200R4 Automatic, A/C, PS, PB & More! 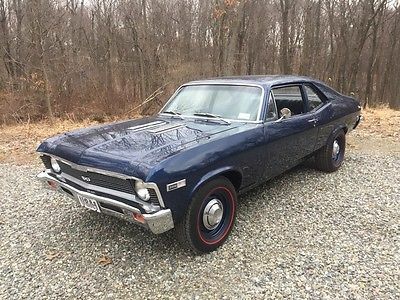 Custom Resto-Mod Nova SS, LS1 360 HP, 4L60E trans, 960 miles on a 1 year old total restoration build with a rust-free body. Heidts bolt-on subframe, coilover shocks, 11" Wilwood brakes, power rack & pinion steering and Ididit steering column. TCI 4-link suspension, Currie 9" Ford rear end, Custom gauges, sleek black interior, custom am/fm/ipod radio, buckets with console, black over Boyd Coddington Red base coat/clear coat paint. TorqThrust 17" wheels. Runs great A true Resto-Mod with LSI engine, 4L60E automatic overdrive transmission, custom front and rear suspension, and Vintage Air.The only reason I am selling this beautiful car is because I am retiring and will no longer be involved in the classic car community.